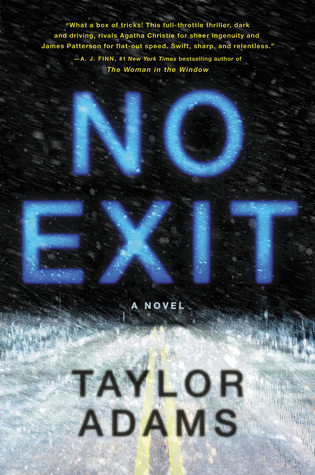 No Exit by Taylor Adams– On her way to Utah to see her dying mother, college student Darby Thorne gets caught in a fierce blizzard in the mountains of Colorado. With the roads impassable, she’s forced to wait out the storm at a remote highway rest stop. Inside, are some vending machines, a coffee maker, and four complete strangers. My Thoughts: I knew I was going to enjoy this book just from the blurb and I was so right. Darby was my favorite kind of character- badass, smart, and willing to do the right thing regardless of the consequences. I literally could not put this book down. I held my iPad in one hand while cooking dinner so I didn’t have to stop reading. I ignored my family completely until I was finished and I stayed up way too late because I had to see how it ended. I can easily see this book being made into a movie. I’d go see it! Darby is on her way to see her dying mother to make amends when a snow storm forces her to stop and hunker down at a rest area with a group of strangers. Roads are closed, cell signal is nonexistent, and her phone battery is almost gone. On the advice of one of the strangers she sets out into the snow in search of a cell signal but she finds something a lot more sinister instead. A little girl trapped in a dog crate in the back of a van. Darby has to figure out which of the four strangers in the rest area are responsible and find a way to save a terrified little girl. The kidnapper seemed obvious but as an avid fan of thrillers I knew there had to be more to the plot. Darby is in a race against time, and a race against evil, to save not only a little girl but herself. I just finished this one too. I enjoyed it. It was a little on the darker side with the violence – I’m not normally bothered by violence but it just seemed a little dark for me. I read it in a day! It would be a great movie. There were some twists I for sure was not expecting!